LISA Y. GARIBAY | Mar. 21, 2014 | UNIVERSITY COMMUNICATIONS. the development of commercial space exploration. Photo courtesy of UTEP Engineering. Hiroshi Ogawa was not only grateful for the sunny weather but also the warmth and open-mindedness of the people he met during his trip to El Paso. While parts of his trip included tourism, he wasn't here on vacation. Ogawa, a master's candidate in avionics, was part of a group of more than 20 students who traveled halfway around the world to meet their counterparts in cutting-edge space travel education and research at The University of Texas at El Paso. Led by aeronautics professor Koichi Yonemoto, Ph.D., the Japanese students represented the Kyushu Institute of Technology, or Kyutech, whose WIRES program offers training for students along with technologies intended to lead to a commercial space flight vehicle. "We are pleased to welcome students from Kyutech to our campus as partners in aerospace technology and 21st century innovation," said UTEP President Diana Natalicio. "Collaborative opportunities like these equip UTEP and Kyutech students with the professional and intercultural skills they need to become leaders in a 21st century global context." Kyutech students interacted with their UTEP peers during informational sessions involving discussion of best practices in engineering design and development, approaches to aerospace systems and a review of Kyutech's winged rocket. 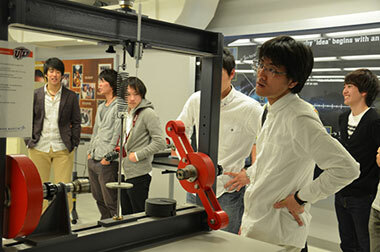 The Japanese students began their visit began by meeting President Natalicio. They then toured the engineering facilities, went on a shopping excursion guided by their UTEP peers, and took a trip to downtown to visit museums and restaurants. Yonemoto has been traveling between Kyutech and UTEP regularly over the past two years to help formalize a faculty and student exchange between the two universities. Their official cooperative agreement was signed in August 2013 (read the UTEP News story about that event here). Yonemoto is now working with UTEP to help formalize collaborative research that can include student projects in mechanical engineering and a rocket launch program his students have been working on. Yonemoto's students are all members of Kyutech's Space Club, which focuses on rocket development, launch, flight-testing and refining of modules after testing. When Yonemoto asked for recruits to visit UTEP, his students eagerly signed up, resulting in a large group of dedicated program participants. The Japanese professor hopes to welcome UTEP students to his own campus sometime soon as the collaboration moves forward. Yonemoto's UTEP counterpart is Nate Robinson, UTEP's director of operations for the Department of Mechanical Engineering's Center for Space Exploration Technology Research (cSETR). Robinson stressed that efforts like these always come back to the students. "We want cross-cultural exchange, of course, but we also want them to be able to convey technical information to audiences that may not be best able to understand it," Robinson said. "Often times (the students) have to present to non-technical people, which is one type of challenge, but then presenting to people who are non-native English speakers is a different kind of challenge." These are skills that are applicable to any industry, which is increasingly occurring as society becomes more globally connected. Along with honing their communication skills, Robinson is hopeful that the partnership with Kyutech will also help UTEP students learn best practices within engineering, collaboration, and research by joining what is working for UTEP with what works best for the Japanese. The end result is an improved education for all students and better projects for both universities. Students who are part of this unique group are also gaining experience connecting their work across the interests of various stakeholders thanks to the participation of the Japan Aerospace Exploration Agency (JAXA), which is the Japanese government's national aerospace agency, and commercial space company PD Aerospace, also from Japan. "Industry, academia and government are working together toward common goals, including workforce training and the development of collaborative research," Robinson said, explaining that the UTEP-Kyutech partnership has educational and practical applications. "If commercial companies, government and universities can get their technology and workforce working more quickly, then it leads to better economic outcomes for everyone." Yonemoto hopes that the rest of 2014 will be dedicated to establishing a formal agreement between UTEP and Kyutech that will allow collaboration to further the rocket project. Yonemoto would like to see a test launch in Texas and apply the data accumulated from that test toward the launch in the future of a much larger version of the craft capable of up to a 100-kilometer altitude above the earth. The collaboration and potential future research will further contribute to the West Texas and Southern New Mexico region establishing itself as a hub for commercial and private space exploration. "We want it to be fun and interesting," Robinson said, "but in the end what we want is students who are better trained to succeed in life, whether it's in this industry, academia or wherever they go."